How can a therapist create the kind of relationship and conversation with a client that allows both to access their creativity and develop possibilities where none seemed to exist before? To answer this important question, Harlene Anderson invites us on a challenging, inspiring journey with an illuminating blend of postmodern theory and clinical narratives. We first meet a Swedish mother, whose experiences in therapy are wrought with frustration. The rest of the book is an answer to this mothers appeal, showing how therapists and clients can become conversational partners in a powerful process of transformation and change. Drawing on her experiences as a practitioner and teacher and on her clients experiences of therapy, Harlene Anderson joins social thinkers who challenge the familiar culture of psychotherapy, including the foundations on which its theory, practice, research, and therapist education have been based. Anderson directly challenges the expert-nonexpert dichotomy and hierarchical structures that flow from it. She asserts that conventional premises and practices have lost their relevance in a world of rapid social transformation, and calls instead for a philosophy of therapy and a way of being in client relationships that invite collaboration. Conversation, Language, and Possibilities forges surprising links between postmodern theory and collaborative clinical practice. In this framework, human systems are viewed as systems of language and communication. Clients voices are privileged. And language is generative in shapingand reshapinghuman life and relationships, creating potentials for positive change as infinite in variety and expression as the individuals who realize them. Drawing on her experiences as a practitioner and teacher and on her clients’ experiences of therapy, Harlene Anderson joins social thinkers who challenge the familiar culture of psychotherapy, including the foundations on which its theory, practice, research, and therapist education have been based. Anderson directly challenges the expert-nonexpert dichotomy and hierarchical structures that flow from it. 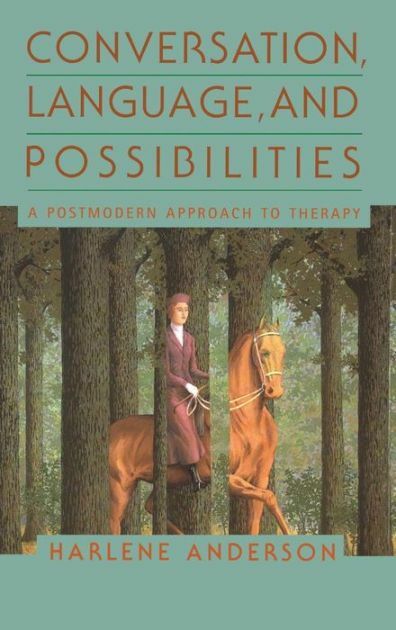 She asserts that conventional premises and practices have lost their relevance in a world of rapid social transformation, and calls instead for a philosophy of therapy and a way of being in client relationships that invite collaboration. Conversation, Language, and Possibilities forges surprising links between postmodern theory and collaborative clinical practice. In this framework, human systems are viewed as systems of language and communication. Clients’ voices are privileged. And language is generative in shaping – and reshaping – human life and relationships, creating potentials for positive change as infinite in variety and expression as the individuals who realize them.